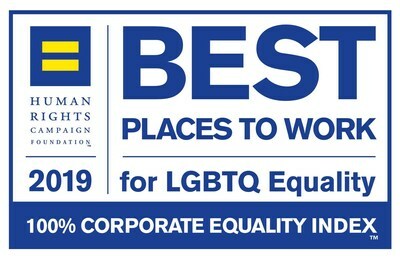 MELVILLE, N.Y., March 28, 2019 /PRNewswire/ — Henry Schein, Inc. (Nasdaq: HSIC) today announced that it received a perfect score of 100 on the 2019 Corporate Equality Index (CEI), the nation’s premier benchmarking survey and report on corporate policies and practices related to LGBTQ workplace equality, administered by the Human Rights Campaign (HRC) Foundation. Henry Schein joins the ranks of more than 560 major U.S. businesses that also earned top marks this year. The 2019 CEI evaluates LGBTQ-related policies and practices, including non-discrimination workplace protections, domestic partner benefits, transgender-inclusive health care benefits, competency programs, and public engagement with the LGBTQ community. Henry Schein’s efforts in satisfying all of the CEI’s criteria results in a 100 percent ranking and the designation as a Best Place to Work for LGBTQ Equality. Henry Schein, Inc. (Nasdaq: HSIC) is a solutions company for health care professionals powered by a network of people and technology. With more than 18,000 Team Schein Members worldwide, the Company’s network of trusted advisors provides more than 1 million customers globally with more than 300 valued solutions that improve operational success and clinical outcomes. Our Business, Clinical, Technology, and Supply Chain solutions help office-based dental and medical practitioners work more efficiently so they can provide quality care more effectively. These solutions also support dental laboratories, government and institutional health care clinics, as well as other alternate care sites. A FORTUNE 500 Company and a member of the S&P 500® and the Nasdaq 100® indexes, Henry Schein is headquartered in Melville, N.Y., and has operations or affiliates in 31 countries. The Company’s sales from continuing operations reached $9.4 billion in 2018, and have grown at a compound annual rate of approximately 13 percent since Henry Schein became a public company in 1995.